If one reads them carefully, despite their vast quantity—the figure usually given is around 6,000—Rudolf Steiner’s lectures rarely fail to astonish and surprise; and always for unique reasons. No matter how many lectures one has read, one always finds new insights, either because the research is new or because Steiner’s mood or disposition in relation to his audience shades his remarks in a way that brings out previously hidden nuances or perspectives not available elsewhere. Such is the case with the three short lecture cycles printed here. The year is 1914; the months October and December: a fate-filled moment both for Anthroposophy and Western civilization. The year before (1913) had seen the expulsion of the German Section from the Theosophical Society and the establishment of the Anthroposophical Society. This finally gave Rudolf Steiner the untrammeled freedom to form his own spiritual movement without the constraints that working within the Adyar-based Theosophical Movement had inevitably imposed. On February 3, the first constitutive General Meeting of the new Society took place and by the middle of the year, it numbered over 3,000 members, active in 85 working groups. That same month, a second, equally epoch-making event occurred when it was finally decided that the “Building,” which in 1918 would be renamed the Goetheanum, but was then still known as the “Johannesbau” or “John Building” after John the Evangelist, would be located in Dornach, Switzerland, rather than in Munich, Germany, as had been previously considered. This decision, long in coming, was made on May 18, and on September 20 the Foundation Stone was laid. By November construction was underway. 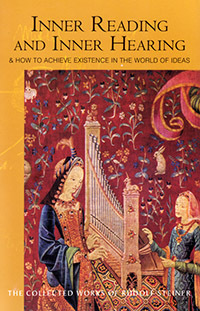 Clearly, the spiritual world was seeking to found something, as may also be seen from the deeply esoteric lectures Steiner gave during this period—such as those on The Fifth Gospel, The Secrets of the Threshold, xii j inner reading and inner hearing The Esoteric Foundations of the Bhagavad-Gita, and Christ and the Spiritual World: The Search for the Holy Grail. By the following year, 1914, as if prophetically preparing for the wartime years, the center of Anthroposophical work had shifted to Dornach, where construction was in full swing and Steiner oversaw all aspects of the work. As a consequence, he was forced to reduce his lecturing activity, though he continued to research and speak on the Fifth Gospel, as well as on life between death and a new birth. It had been his hope to open the Johannesbau by December. However, with the inception of hostilities, following the assassination of Archduke Franz Ferdinand in Sarajevo on June 28, that of course did not happen. Events moved very fast, as the world caught fire. By the end of July, Austria-Hungary had declared war on Serbia, and Russia had ordered the mobilization of troops. On August 1, Germany declared war on Russia; on August 3 on France; on August 4, Germany invaded Belgium and Britain declared war on Germany. The die was cast.